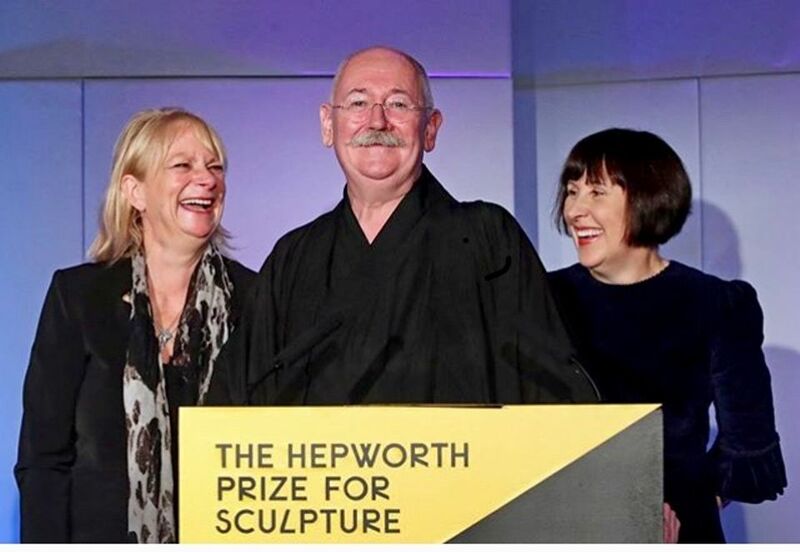 Cerith Wyn Evans was in gloriously provocative form at the awards dinner for the Hepworth Prize for Sculpture last Thursday 15 November. When called up to the podium as the winner of the £30,000 prize, the man who last year filled the Tate Britain’s Duveen Galleries with a dazzling dangling sculpture in white neon, declared that he had absolutely nothing to say except to thank his friend and Royal College Design MA alumna Tom Foulsham, who had physically made the prizewinning work Composition for 37 Flutes (in two parts). Nonetheless, live on BBC Radio he stated that it was his intention to use the prize money to “fight Brexit” before offering a subversive twist to his decidedly monkish demeanour with a spot of sartorial adjustment which involved reclining on the gallery floor and – much to the delight of all those present, including your own correspondent - hitching up the skirts of his robes to reveal a cheeky expanse of underwear and upper thigh. However, no shenanigans could detract from the powerful and poetic presence of Wyn Evans’s work itself which consists of two suspended interconnected glass arcs from which emanate 37 crystal flutes that are in turn powered by organ pumps to emit a mournful and haunting sound. Composition for 37 Flutes offers a magical combination of drawing, instrument, apparatus and sculpture and is a worthy winner of a prize that is committed to the development of contemporary sculpture. Wyn Evans describes the piece as a “threnody for Barbara” and I have no doubt that Ms Hepworth would have utterly approved.